These combo systems were probably distributed on in Europe. I have no confirmations that they were available also in USA. The Mini Hi-Fi combo is probably pretty rare since I never saw one in shops. The Tv combo was widely available but was sold at a very high price. Mini Hi-Fi system with: Audio Digital Radio Tuner, two decks tape recorder/player, 2x25W amplifier, two speakers with 2 ways bass reflex. Digital Sound Control, Dynamic Sound Control, On screen program display. 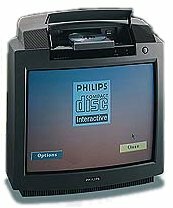 One of the two combo offers from Philips: it was a Mini Hi-Fi system with built-in CD-I player. The second combo offer from Philips: a 21" colour TV sets with built-in CD-I player (with Digital Video capability) in the same cabinet.